Painting for over 30 years, Martin is a completely self-taught artist specialising in contemporary oil paintings. 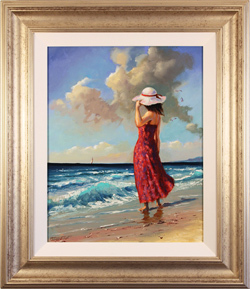 What began as a hobby has now progressed into a successful professional career, with several paintings now published as limited edition prints. His work has unsurprisingly become incredibly popular among collectors, and can be found in collections in the UK, Australia, South Africa and the US. Martin’s ability to capture the emotion of his figurative subjects and translate it into a work of corresponding tone is truly remarkable. Read the full Martin Leighton biography.